Back in August I held a family get-together here at our home and I made a big punch bowl full of this delicious tasting Raspberry Punch! I used fresh raspberries but you can certainly use frozen/thawed raspberries too. 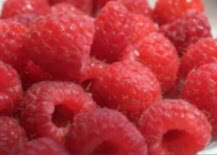 You will want to run the raspberries through your blender to puree them. In a large punch bowl blend together all of the above ingredients. You can add some ice cubes or your own ring of ice. * I make my own ice cubes from puree'd raspberry juice so that our punch is nice and cold but not water downed. My second tip is to mix up your punch about 15 minutes before you want to serve it as it tastes better ice cold!